Don’t get me wrong: I love Americanized Mexican and Latino cuisine. I grew up on nachos with fake cheese, pickled jalepenos and ground “meat.” As a youth, eating “Mexican” food meant that at least one item on my plate would be coated in cheddar cheese. Even after learning how delicious regional Mexican home cooking was, I still have the occasional hankering for sour cream and guacamole topped deep fried goodness that I grew up eating. Nonetheless, as I got older I found some “authentic” restaurants. I’ve always loved to try new things, and the newness of something that I thought I knew made me want to try more and more. The flavors were unexpected. The lettuce and the tomato garnishes weren’t the only fresh ingredients involved in these meals. Overtime, my experience with eating good quality Mexican and Latino food impacted my cooking at home. 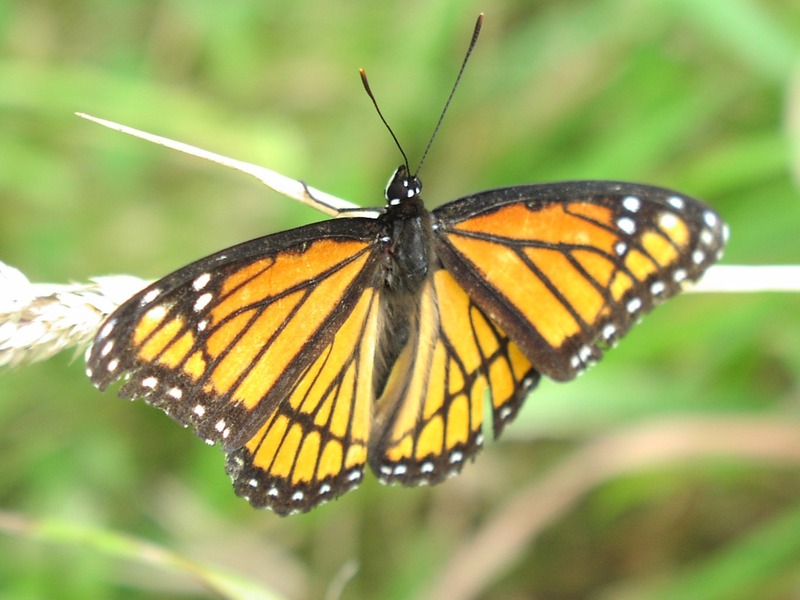 I learned that the herbal note missing from some of my dishes was Mexican oregano. I learned to buy the darkest plantains I could find and to add epazote to make my black beans. Cajeta became our preferred ice cream topper. With access to well stocked tiendas, I became more than comfortable cooking Latino and Mexican cuisine. These foods became part of my family’s everyday meals. Thus when I would drive in from SeaTac to visit my folks over the last year or so, my eye was caught by a little blue gem of a restaurant that I saw as I headed towards my folks’ place: La Salvedorena. I tried to figure out how my wife and I might surreptitiously sneak over for a bite during one of the visits, but that wasn’t in the cards. After driving out here from Columbus and after we had unpacked enough, we wanted to dine out for the first time. We decided upon this restaurant. We ate. After a few days, we came back. And then again. I think it is proper that it is the first restaurant that I review here. La Salvadorena is an unpretentious restaurant. The interior of the restaurant is a placid blue that compliments the exterior. Happily, the restaurant is not decorated with the cultural tourist in mind. There are a few wall hangings that teach visitors basic facts about El Salvador, but, like many really good ethnic restaurants, they do not exoticize their own culture for gastronomic tourists. Tables for larger parties are set against laced curtained windows. Tables for two are in the center of the room. A menu board above the counter has the specials and some of the regular menu. The fold-out menus next to the register have the restaurant’s entire offerings. After looking at the menus at the counter, you order. My stumbling, bumbling attempts at Spanish have been met with patience and good humor, and they have never mixed up a single order we’ve placed. 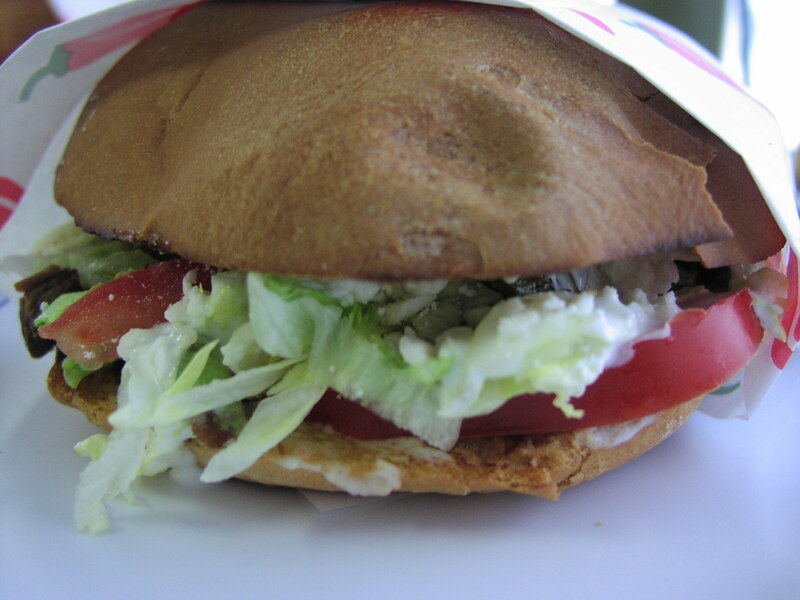 I’m slightly obsessed with the tortas (sandwiches), which sell for $5.50 each. The bread used for the tortas is like a light ciabatta. It is toasted inside AND outside. That’s right, double toastiness, which is a big deal to me. The picture here is of a carne asada (chopped steak) torta. It comes with a creamy, salty sauce and fresh lettuce and tomato. The mixture of textures in these sandwiches is simply amazing. One would likely make a good lunch by itself, but I seem to always have room for at least one pupusa. Or two. Maybe three if I’m feeling gluttonous. Pupusas are the specialty of the house and very reasonable: $1.50 per. Pupusas start as balls of corn dough that are filled and patted into a disk. After you order them, you can hear them being slapped flat fresh in the kitchen. That disk is then fried on a griddle until the outside darkens, but the interior stays moist. All dishes are served with a semi-spicy green sauce and a bit-more-spicy red sauce. 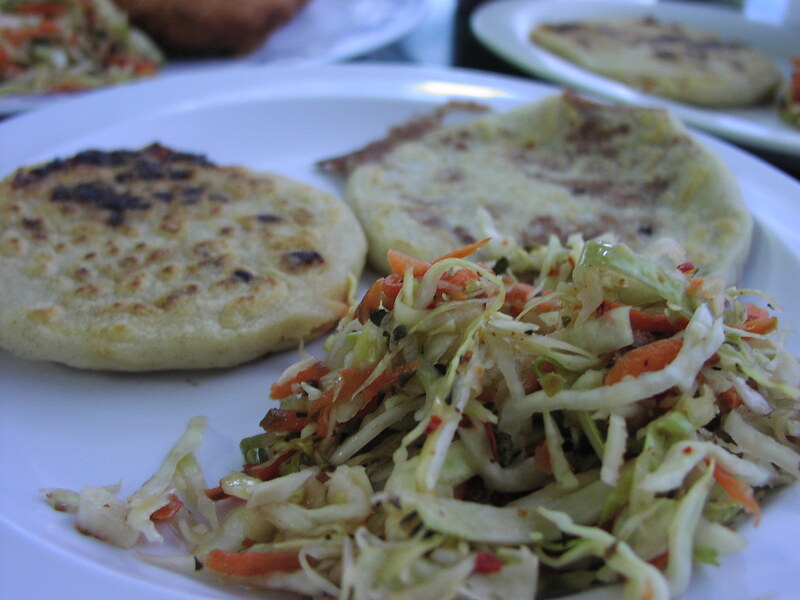 All pupusas are served with a house made spicy cabbage slaw called curtido (also in the pupusa picture). The curtido is fresh rather than fully pickled and is the perfect salty, pungent, crunchy counter to the creamy pupusas. It has a kick. 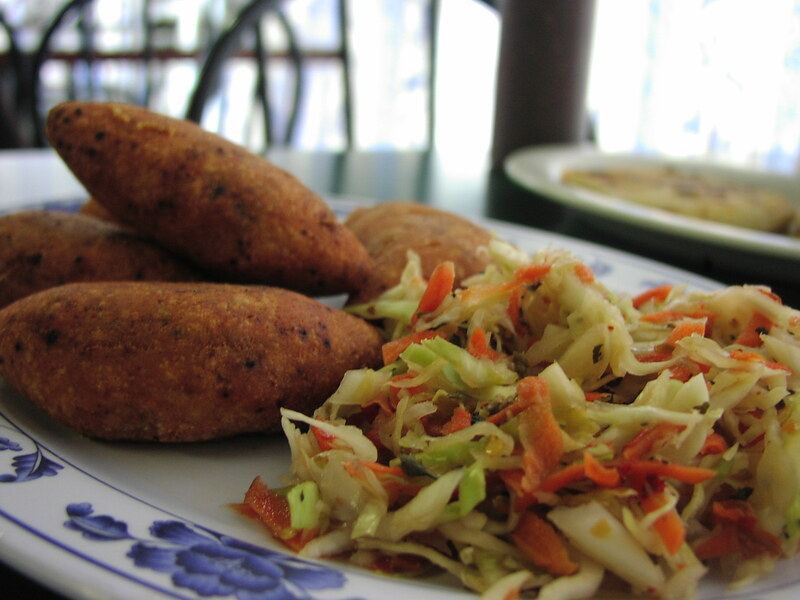 The pupusas come with a variety of fillings. 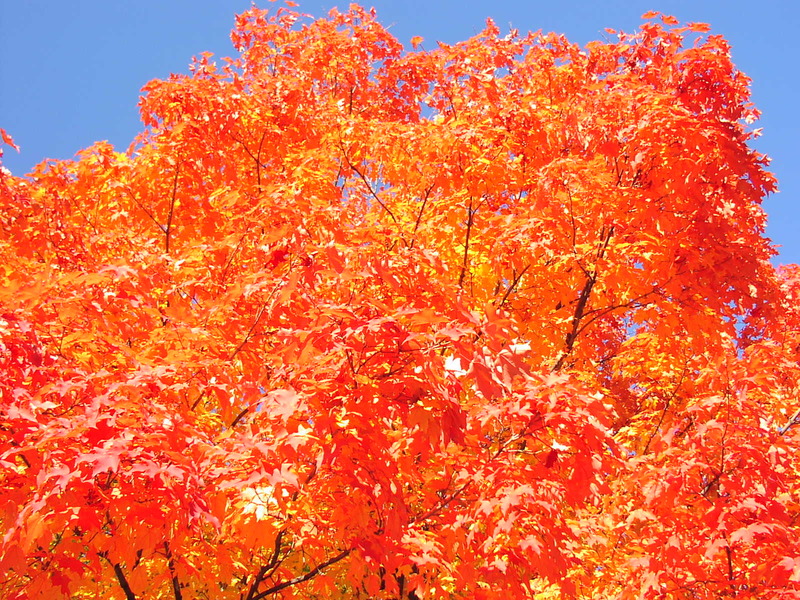 Our favorite is revuelta (pork), but loroco, a plant native to El Salvador and Guatemala is a close second. Traditionally, they are eaten by hand after some curtido and red sauce is placed on top of them. I ate mine with a fork. Sue me. The tamales ($1.50 each) are made in banana leaves, and the masa they use is seasoned–corn is still the prominent flavor, but the savory and spicy red seasonings added to the dough keep the tamales from ever being bland. The tamales de pollo are filled with big chunks of tender chicken and potatoes. The pastels de carne (top picture) are crispy, fried pastries filled with the same chopped carne asada as the tortas ($5.50 for 5 with curtido). They meat is highly seasoned–it’s salty (in a good way) and garlicky. They come out rocket hot, so break the first couple in two and let them cool to avoid mouth cauterization. I also recommend the Horchata. 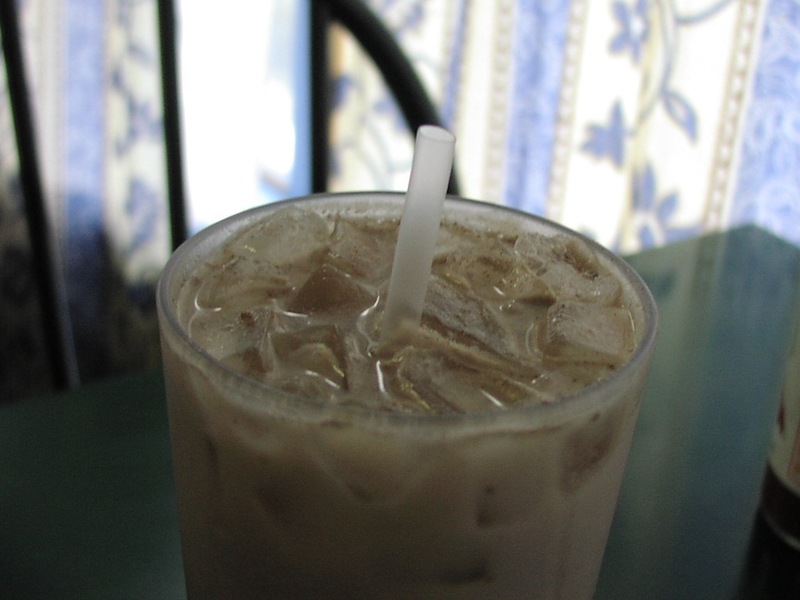 It is Salvadoran style, so it contains some cocoa and spices that Mexican style Horchata does not. They have some combination dinners that include rice, beans, tortillas and salad. Most of these are the usual suspects: fajitas, grilled chicken and beef, and spicy shrimp (a la Diabola). I have yet to try fish plate, grilled spare ribs or chicken enchiladas in mole, but that will change soon (expect a part two to this review). I haven’t put up pictures of the tacos yet, but those are good as well $1.50 each, and they come with curtido as well. They come in four to five inch corn tortillas that are grilled until pliable and slightly crisped around the edges. The toppings mirror those available for the pupusas but also include tongue (served in small dice). They are always topped with fresh cilantro. Nutshell: Go to La Salvadorena. The food is extremely good and a great value. The service is very, very good. The cooks take care to make sure everything leaving the kitchen tastes and looks good. Thus far, they have always been successful. I highly recommend this restaurant to locals and tourists alike.